As shown in Table 48 and Table 49, the number of countries importing cassava starch is quite diverse but concentrated with only four countries (China, Indonesia, Malaysia and Japan) accounting for 82 percent of world imports in 1995. The exciting discovery is that the import demand for cassava starch increased substantially after 1980, with the development of modified starches. Exporters of cassava starch are more concentrated than the importer destinations, with three countries (Thailand, Indonesia and Brazil) accounting for 95 percent of world exports. Thailand, in fact, accounts for 85 percent of exported cassava starch. 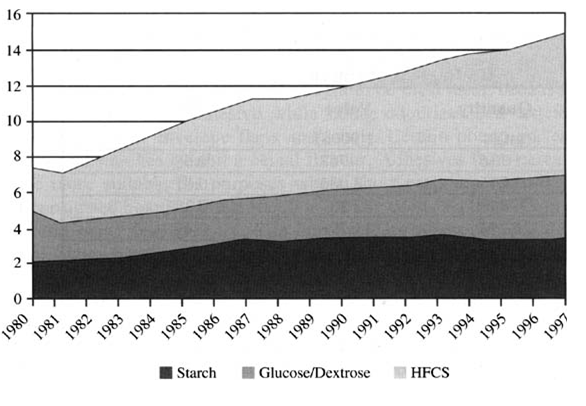 Interestingly, the import demand for cassava starch increased substantially after 1980, with the development of modified starches, and has continued to grow, also in 1995 (Table 49). Starch is used to produce such diverse products as: food, paper, textiles, adhesives, beverages, confectionery, pharmaceuticals and building materials. Some of these applications are discussed below. Starch is used in the paper industry in four major operations: wet end applications of starch, size press applications of starch, calendar applications, and paper coatings. Wet end applications of starch increase the strength of finished paper and improve the retention of the fibres in the manufacturing process. Starches in the size press and calendar applications improve the appearance and function of the finished paper. Starch in the coating application acts as an adhesive in pigment coatings of paper. Similar to paper, starch is used in the textile industry in three main areas: sizing, finishing and printing. Approximately 80% of the starch used in textiles is used in sizing where individual fibres of yarn must be shaped or formed into a warp that pass through a sizing solution that coats the surface of the twisted warp. The coated yarn is then heated to dry the size and a beam of warp is ready for weaving. Properties of the starch used are abrasion resistance, flexibility, be able to form a bond to the fibre, penetrate the fibre bundle to some extent, and have enough water holding capacity so that the fibre itself does not rob the size of its hydration. Finishing is an inclusive term meaning the transformation of grey goods from the loom to a finished product that is attractive to the consuming public. It includes the process of covering blemishes or defeats that may be in the yarn. Textile printing or the impression of a design on fabric requires a carrier for the dyes and pigments and modified starches have found special uses in these applications. Printing pastes are high-viscosity mediums that preferably will not change on ageing and will resist the effect of added acids or alkalis as required by colour agents. A sharp image is required and thus a short non-stringy paste. Modified starches are frequently mixed with other industrial gums to give the required viscosity and paste characteristics. Glass fibre sizing is a special case among textile fibres sized with starches. Starches finding use as glass fibre sizes are those with high film strength and which are incompletely cooked under normal cooking conditions, but which still form a good film. The characteristic of dispersion instability appears to be one of the more desirable properties. Thus the starch products most frequently found are cross-linked starches, corn and potato, high amylose varieties and their derivatives, as well as some cationic starches. Although most of the glass sized yarn made goes into fabric uses, a portion is used for electrical insulation and in circuit boards. Starch is a popular base for adhesives, particularly those designed to bond paper, in some form, to itself or to other materials, such as glass, mineral wool and clay. Starch can also be used as a binder or adhesive for non-paper substances such as charcoal in charcoal briquettes, mineral wool in ceiling tiles, and ceramics before firing. The starches most commonly used for the manufacture of adhesive pastes are maize, potato, and tapioca and of these the latter appears more suitable in several respects. Cassava starch adhesives are more viscous and smoother working. They are fluid, stable glues of neutral pH that can be easily prepared and can be combined with many synthetic resin emulsions. Corn and rice starches take a much longer time to prepare and a higher temperature to reach the same level of conversion. In fact, for top-quality work, cassava starch is thought to be most ideal, because it is slightly greater in strength than a potato starch adhesive while being odourless and tasteless, excellent as an adhesive for postage stamps, envelope flaps and labels. Certain potato pastes have bitter tasting properties while cereal starches exhibit a cereal flavour. Adhesives from cereal starches have poor mobility and are more suitable for purposes where short parts are required for example in the manufacture of corrugated boards. Wheat starch is usually used as a thick paste in the adhesive base for bill posting and paper bag industry. The only heading where tapioca dextrin is specifically mentioned in A.E. Staley product list is under remoistenable adhesives. Poster pastes used for billboards, wallpaper and other pasting operations that manual alignment of patterns, edges also tend to utilize high-viscosity starches. Satisfactory texture or slip properties may be achieved via cross-linking, (Wurzburg 1987) Properties required include low shear resistance or "slip" permitting the paper to be aligned precisely without losing contact with the substrate, good open time (range of tack), slow setting speed. Gummed tape employs middle of the range viscosities. Properties required include rapid absorption of water by the dried film, high cohesive strength (tackiness) when wet, limited tendency to curl, stable re-moistening properties in the dried film, low application viscosity. To meet these requirements it is important that the starch have little or no tendency to retrograde in the dried film. Using starches low in amylose can most readily achieve this property, and/or by subjecting the starch to retrogradation inhibiting treatments on base starches such as tapioca, potato, or waxy cereal starches which is the preferred approach. (Wurzburg 1987). A popular type of bottle labelling adhesive is the "jelly gum" made primarily from cohesive starches (root or waxy cornstarch), which have been cooked in sodium hydroxide. Properties required include the starch to be high in molecular weight, "snappy", the ability to pick up the label and anchor it to the bottle even if the bottle is wet, and "ice proof 'resistant to re-solubilizing, especially in cold water. Modified starches are used in food processing in a variety of ways. Modified starches increase the acceptability and palatability of many processed foods to consumers. Modified starches are also used to reduce costs of established food products. More expensive ingredients such as tomato solids, fruit solids, or cocoa powder can be extended with combinations of modified food starches, flavours, and other inexpensive food substances. Modified starches and dextrins have successfully replaced caseinates in meat emulsions, coffee whiteners, and imitation cheeses. Modified dextrins are also used to replace butterfat in ice cream and ice milk, vegetable oil in salad dressings and shortening in icings. Modified food starches and dextrins play a very important role in cost reduction efforts. In 1997 the U.S. imported 13,551 metric tonnes of cassava starch and 6,889 metric tonnes of tapioca starch. In Canada 1,771 metric tonnes of cassava starch and 1,043 metric tonnes of tapioca starch were imported. Other imported starches into the U.S. in 1997 are presented in Table 50. This level of cassava starch import is dwarfed by the size of the U.S. corn refining industry that produced 2.7 million metric tonnes of cornstarch in 1997. The U.S. corn refining industry in 1997, representing 20% of total corn use, utilized over 46 million metric tonnes of corn. Approximately a third of the corn used by refiners goes into high fructose corn syrup production. Another third goes into fuel alcohol (ethanol). A final third goes into starch sweeteners (glucose and dextrose) and cornstarch. Although cassava starch imports are quite small today, this was not always the case. Cassava was the main source of amylopectin starch in the U.S. until World War II when the Japanese severed supply lines and forced processors to turn to waxy corn. Waxy corn found in China in the early 1900s was introduced into the U.S. in 1909 but remained a curiosity until the mid-1930s. In the early 1940s work at the Iowa Agricultural Experiment Station revealed that the amylopectin starch from waxy corn had properties similar to tapioca starch (International Starch Institute). Few counties in Iowa, Illinois and Indiana accounts for about a half million acres or 0.6 percent of total planted corn acreage in the U.S. (Crookson 1979). To meet the future needs of their consumers, refiners continue to actively invest and support waxy corn breeding programmes and production (National Corn Growers Association). Contract agreements between refiners and farmers specify certain grain quality standards and waxy purity requirements. Variations in the amylopectin components can result in failures by the wet milling processor to meet specific standards of the processed starch. Therefore, premiums are paid to the waxy grain producers by the wet miller to compensate for the extra quality control procedures that must be followed. Typically waxy corn commands a premium price (-25-30 cents/bushel) above U.S. No. 2 yellow corn prices (Fergason 1994). Today the major markets for sweeteners are nearly saturated making their prices highly competitive. This was apparent in 1995 when rising corn prices were passed along to higher starch prices but not to the price of HFCS and dextrose sweeteners. 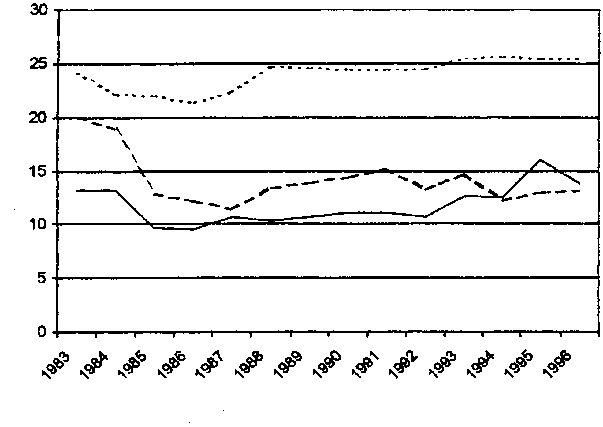 Higher corn prices, at over tre dollars a bushel, gave a boost to cassava starch imports in 1996 (Figure 21). Cassava starch use is highly dependent on the stability of U.S. corn production and the U.S. economy. National Starch and Chemical company, for example, has been plagued by exposure to volatile raw corn and paper markets since 1990. The company had increased prices moderately throughout the 1980s to support market development, service and research, and to raise development teams. In 1990, as a result of recession and the consequent volatile corn markets, National had to cut its prices, decrease its research and development programmes and also reduce staff. To maintain position, product lines were shifted away from the paper industry toward the food industry with larger and more predictable profit margins. As a result, cassava and cassava-blended starches have become more important to National (Watson 1988). The paper industry responded by shifting away from more expensive and higher quality waxy maize and potato starches to less expensive dent corn. Starch and starch products are used in a variety of ways in many food and manufacturing industries. Industrial use accounts for approximately 75% of starch consumption while food use accounts for 25%. The paper and corrugated box manufacturing industry uses about 80% of the industrial starch supply, followed by textiles, adhesives and other industries. Details of the industries that use starch in their manufacturing by SIC code will be published on the Global Cassava Strategy web site. Appendix 1 describes briefly starch applications. An example of a large user of industrial starch in the U.S. is the paper industry. In fact, the U.S. is the world's largest producer of paper and allied products with a 180 million metric tonne capacity, 162 million metric tonne production and 167 million metric tonne demand Table 51. As paper and paper products demand grows in North America so will the demand for starch. Currently the total volume of industrial starches consumed in paper and paperboard mills in North America is about 1.3 million metric tonnes at industry capacity. World demand for paper has doubled in the past 20 years and is forecast to double again by the year 2010. According to the Canadian Pulp and Paper Association, the annual consumption growth rate for paper and paperboard over the next 15 years is expected to be 3.2% (2.5% in developed countries and 5.5% in developing countries). In North America, production of printing and writing paper grew at a rate of seven percent annually in Canada and tre percent, in the U.S. between 1980 and 1996 (Table 52). The reduction and removal of trade barriers will also positively affect export growth in North America in the future. Canada for example, recently won an agreement from the European Union for the early phase-out of tariffs on many Canadian paper grades. In the year 2000 the EU tariff on many non-newsprint grades was phased out and in 2002 the tariff on newsprint will equally be cancelled. One of the greatest areas of growth for starch of late has been in the use of wet-end starches primarily cationic corn and potato starch. The total wet-end starch market is currently valued at 230-250 million dollars or 238 000 metric tonnes and is expected to grow at 10% or more annually. The reason for the increased starch use is the increased use of alkaline paper making techniques. Alkaline papermaking has been in use for over 30 years in Europe but has only recently been adopted in North America. As inexpensive filler loadings increase, the loss in strength is made up for by additional starch use, saving mills $15 to $70 a tonne depending on the paper grade (Wurzburg 1987). A second growth area has been in the use of surface sizing, a high volume consumer of pearl and pre-converted starches. Almost 909 000 metric tonnes of unmodified and modified starches were used in size presses of late. This starch use has grown because of the increased volume of paper capacity introduced since 1990. Almost 1.5 million tonnes of uncoated freesheet capacity was added, all of it using starch as a primary surface-sizing component. A third area of growth is at the size press where more innovative equipment is being installed that applies a film of cationic starch; thus making paper perform like a coated matte of No.3 grade and challenging fully coated paper mills. Starch use in coating paper and board is flat or declining of late. Starch has lost market share to latex because of latex's ability to provide optical properties like gloss. Starch has also lost to protein in board coatings because of protein's ability to promote wet-end strength in carrier stock. Starch consumption used in lightweight coating has grown with new capacity but as quality rises, starch use declines (Paperfo - webpage). Among the board mills, National Starch and Chemical is the starch leader. Staley and Penford are equal leaders in the paper market. Penford Gums and Ethylex are equal leaders in surface sizing applications. Another user of starch is the food and beverage industry. The plant sources for modified food starches in North America are predominately corn, potato and tapioca. Four corn varieties are used: dent corn, waxy corn, and two varieties of high amylose corn. Cassava starch is used to a much lesser extent than corn, but its importance as a source of modified food starches is growing rapidly. Unmodified starches are widely used in the bakery industry. But have limited resistance to the physical conditions applied in modern baking and industrial heating processes. It is modified waxy maize and cassava starches that are increasingly being used to produce a large number of cross-linked and substituted food starches used in modern baking and industrial heating processes. A description of the allowable food starch modifications as outlined by the Food and Drug Administration's Code of Federal Regulations is provided in Appendix 2. Confectionery manufacturers and fruit and vegetable processors account for one-third of the food industry starch consumption, followed by bakeries, biscuit manufacturers and other food processors. Growth opportunities for the development of cassava starch in North America are limited because of the preference and availability of locally produced starch sources. This disadvantage is heightened by the ability of chemists to create specialized starches. The close co-operation between the end users of starch and starch manufacturers in the development of specific starch products means that outsiders have little opportunity to know the new modifications that are required until after the modified starch has been used. Imported modified starches are usually produced through a joint venture or agreement with a North American company (see Chapter 3 of the Thai experience with the development of modified starches). Growth opportunities for cassava starch in North America are further restricted, owing to the co-operation between the U.S. and Canadian governments and domestic corn producers and processors. One example of such co-operation is the "Plant/CropBased Renewable Resources 2020" agreement between the U.S. Department of Agriculture, agricultural producers' groups and the U.S. Department of Energy. The purpose of the agreement is to stimulate research and development of new products made from agricultural commodities such as corn, wheat and soybeans. This co-operation agreement is aimed at finding new ways to use crops, trees, other plant material and agricultural wastes to manufacture products such as plastics, paints and adhesives. The agreement is in effect for two years with a budget of approximately $100 million, and may be extended (Canadian Pulp and Paper Association). The starch industry is a very vibrant and exciting industry. Starches are highly substitutable, but cassava starch does have properties of clarity, viscosity and cold temperature that give it a competitive edge. Nevertheless, price and location are the prime factors that determine the demand of various starches and their bases (see the following section on the European starch market). The demand for starch in North America is driven by the demands for final products that use starch in their production process. The nature of this demand means that starch suppliers, especially non-North American suppliers, have a very limited ability to develop and expand their product markets. Exporters of cassava starch can extol the virtues of their product, but their main function is to provide, when requested, the appropriate quality of starch at the correct time, with a competitive price. The quality and technology required to produce starches varies from industry to industry. At the risk of oversimplifying the industry, it can be said that the glue and plywood industries use starches that are the easiest to produce and have the least restrictive specifications. For these uses price is the prime determinant of which starch is used. The paper and textile industry require a higher quality of starch with modified starch being required for a number of operations. For these uses price and specifications become more important as determinants of competitiveness. The food industry requires the highest quality. For this industry the starch often times has to be designed for specific uses. The North American demand for cassava starch will probably grow proportionally with the starch industry through joint ventures and partnerships between North American companies and cassava producing countries. An additional and perhaps more important benefit for the developing countries of these joint ventures may be the expanded use of cassava and modified cassava starches domestically. For development of the cassava starch market, the key stakeholders are exporters and importers of cassava starch, wet corn milling producers, starch end users, corn producers, and government. The North American stakeholders are the most influential and powerful. Their sheer size and ability to influence creates a barrier to new entrants. In many of the starch consuming industries, only one or two companies dominate their industry. Cassava starch imports constitute a very small share of the total European Union (EU) starch utilisation. However, there is an increasing diversification of European starch companies in joint ventures exploring cassava as an alternative starch source, especially in SE Asia. In this section, more light is shed on the dynamics of the EU starch industry and the principal factors that influence its future. Hence, the discussion focuses on the starches that compete with cassava rather than cassava starch itself. EU starch production is estimated at 7.1-7.3 mmt, and processed from a variety of sources such as wheat (21%), maize (33%) and potato (46%). Raw materials are rarely imported because of prohibitive levies. In some cases, there may be reduced levy regulations (as in Spain and Portugal) or applications for Inward Processing Relief (IPR) which is a mechanism to import raw materials (not applying to wheat) at "competitive" prices, when domestic harvests are insufficient to supply the industry. Furthermore, refunds are a key factor for processor's competitiveness, when EU grain prices are above world price levels. Some of the major starch factories are "mixed plants", relying on two different starch sources, wheat and maize (AAC, 1997). The four largest companies, Cerestar, Roquette, Amylum and Avebe, together produce almost 80% of total EU starches. These companies are quite different in history, ownership and specialization. For example, Cerestar is more specialized in glucose syrups, while Roquette has the market edge for polyhydric alcohols, and Amylum is a market leader with HFS. Avebe is largely potato sourced and is becoming particularly strong in specialized starches for non-food industries, while traditionally catering to paper and food-industries. Most of these companies operate factories in several European countries (in addition to having shared processing interests in Asia and the Americas). Compared to the US, the European starch companies are more diversified in both source bases and product portfolio, but on average have significantly smaller installed capacity or plant scale. EU starch by product group is made up of, starch sweeteners (51%), native starches (27.5%) and modified starches (21.5%). Some sources make the rough distinction of starches versus fermentation products. However, from a market and policy point of view, the important distinction is, starches for food or non-food usage. EU starch can be grouped as: Food use (12%), Non-food use (41%), Ethanol (3%), HFS (4%) and Other sweeteners (40%) (Henry, Westby, and Collinson 1998). Compared to the US, the EU food and non-food shares are significantly larger, while the HFS and ethanol shares are significantly smaller. The EU starch use can be further grouped according to industry utilisation: Sweets and drinks (33-34%), Processed foods (21-22%), Pharma and chemicals (15-16%), Paper and corrugating (27-28%) and Feed (2%). The EU's HFS industry is subject to rigorous government interventions, most importantly through the allocation by country and company of annual production quotas. These quotas can only change when there is a new member-country of the EU - bringing in an additional quota. These regulations basically protect the EU domestic sugar industry, but have put a ceiling to the HFS industry development in the EU. The EU's HFS world market share is estimated at 3%, while the US maintains a 75% share. World HFS production, at a current estimated 10 mmt, has been growing at an average 5% per year (USDA-ERS, 1998). While the US seems to have an installed over-capacity, the EU may have a potential under-capacity. HFS's principal demand comes from the soft drinks industry. While ethanol production in the US is strongly subsidised, in the EU, very few advantageous government interventions exist for ethanol production, although it is known that approximately 40% of total EU starch production benefits from "production refunds". The subsidy absence for ethanol, according to experts, is the main reason for the small size of this product output. Modified (chemically) starches for non-food use theoretically enjoy a system of refunds for compensation of high-prized internal raw material purchases, while selling in relatively unprotected markets. These interventions have led to a relative rapid growth of the sub-sector, since 1985. But, according to AAC (1997), the "production refund" is not sufficient to ensure supplies at world market levels. This starch industry is facing serious difficulties from cheaper imports, particularly with the bio-chemical industry. As a result, margins have diminished to such an extent that certain starch producers have switched sales away from the bio-chemical industry to the food sector. Cheaper bio-chemical product imports are possible because the EU starch (hydrolysates) industry lacks economies of scale and suffers from much higher (than the US) operating costs (AAC, 1997). On the other hand, in the food sector, EU starch products can be priced on the basis of their functionality because the finished products of this sector are properly protected from imports (AAC, 1997). The above discussion already has implicitly shown several indications of future growth. Because of domestic sugar industry protectionism, the HFS industry has a very limited growth. Ethanol production, on the other hand, does not enjoy any significant subsidies, as is the case with some of the other starch or fermentation products, and hence its market and market growth seemed limited. However, one can argue that in the longer run, more attention may be paid, in Europe, to more environmental friendly fuels, which may then benefit the ethanol industry. If Europe would follow similar industrial product developments as in the US, future lysine and citric acid demand would continue to strengthen (USDA-ERS, 1998). But on the other hand, if US capacity would increase, citric acid imports from the EU would decrease, putting further pressure on internal EU markets. Table 53 shows a strong growth rate for starches for food use, because of further increased product technology advances, beneficial subsidies and refunds, and the relative competitiveness problems in the non-food sector. One important phenomenon that needs to be discussed here is the recent shift from maize to wheat as a source crop for EU starch. According to the AAC, over the last five years, the share of wheat rose from 23 to 35% in the EU starch industry, almost surpassing the share of maize. The main reason has been cost reduction opportunities, because of the premium of wheat by-products, especially high-valued wheat gluten. As such, wheat has become the relative cheaper starch source in the EU. "In order to safeguard the competitiveness of the EU industry, the high structural industrial costs in the EU should be taken into account during the next WTO trade negotiations. The EU should therefore negotiate a border protection for starchy products, as long as the high structural costs generated by EU policies have not been harmonized" (AAC, 1997). Given the current characteristics and dynamics of the EU starch industry, there are basically two windows of opportunity for cassava starches to increase its EU market share: (a) in the same product markets at lower prices, and (b) in niche markets. As is shown in Henry (Henry, Westby, and Collinson 1998) and further in this report, traditionally, almost the entire traded cassava starch volume has originated from SEAsia, and in particular from Thailand. Currently only a small volume of cassava starch is imported into the EU, mainly owing to prohibitive import tariffs. Nonetheless, as was noted in the earlier report, in 1996, Thailand exported double the volume that it is officially allotted (10 000 mt at preferential tariff rate of 150 ECU/mt), at the higher tariff rate (260 ECU/mt) and was still competitive. If, on the one hand, Thai cassava starch costs could be further reduced, and on the other hand, WTO-regulations would further reduce EU tariffs, as is expected, cassava starches could increasingly compete with EU starches. Table 54 compares various world prices of commonly traded starches, showing the competitive price of cassava starch. However, comparing the social costs versus the private costs of the US, EU, SE Asian and Latin-American starch manufacturing, it would show that the current US and EU starch competitiveness and subsequent world market shares, are to a large extent due to an extensive and complex array of domestic policy measures. These US and EU policies are represented mostly by direct and indirect subsidies, intervention prices, import tariffs and quotas and export refunds. If future World Trade Organization (WTO) trade negotiations will further reduce international barriers to trade, EU and US starch industry competitiveness will be reduced. Thus directly benefiting the market positions of Asian (and Latin American) cassava starch products. The other major argument regards raw materials. Whereas, US and EU corn, potato and wheat production are nearing optimal yield ceilings, cassava production, for example in Thailand, is still at a very low level of technology, yielding average outputs of 13-14 metric tonnes per hectare. As demonstrated by Henry and Gottret, Thai cassava yields can potentially be more than doubled, with current technological advances such as improved varieties, soil and plant management and cultural practices (Henry and Gottret 1996). Hence, the potential for cassava production to advance and consequently reduce per unit costs is far greater, than for US and EU starch sources. In time, this will be one of the most important factors underlying improved cassava starch market competitiveness. One aspect that needs further discussion is the issue of starch processing by-products. Corn and wheat starch processing generate high-valued by-products in the form of gluten, bran, fibre, and germ. Cassava and potato starch processing by-products are of low quality and value. Moreover, liquid cassava processing waste requires a costly process for recycling. Hence, the starch processing cost comparison becomes highly complicated when taking into account the cost and benefits of its by-products. Table 55 attempts to compare the various starch production, processing and market factors in a qualitative perspective. Cassava starches incorporate various intrinsic characteristics or functional properties, especially with respect to grain-based starches, that translate into relative comparative advantages for further processing. It needs to be stressed that most of these advantages are not absolute, since grain-based starches after additional manipulations could acquire similar characteristics, at an additional cost. The key therefore, is that the basic cassava starch without additional manipulation or modification incorporates these special functionalities. Cassava starch state-of-the-art R&D includes the following main special characteristics that enjoy premiums, especially in food industries, and to a lesser extent in other non-food industries, such as in the pharmaceutical industry. These caracteristics are, high transparency and high suitability for ready cooked foods, sauces; high resistance to acidity and good applicability for acid-based sauces, jams, etc. Other caracteristics are, high viscosity which is applicable for desserts, puddings, soups, fillings, gums; and a high purity, absence of gluten, phosphate, oil, fat and proteins, all of which are highly desirable for low-fat diet foods, foods without gluten, and anti-allergic diets. Extensive cassava product development research in Thailand demonstrated that when comparing the suitability and/or performance of potato, corn, wheat, cassava and waxy maize starches in the manufacturing of a wide range of food product groups, cassava starch rated second best, after potato starch. The ratings for the starches were 42, 21, 21, 34 and 32, respectively (Maneepun 1997). If the higher price of potato starch is taken into account (see Table 55), the competitiveness of cassava starch is very strong. However, relative comparative functional property advantages can be eroded by tecnology advancement. At the same tin, R&D can further develop cassava opportunities. Stockli and Rieder (1997) argue that modern biotechnology could general-genetically engineered cassava that would have excellent properties for the manufacturing of, for example, cheap thermo-bioplastics. An additional indirect effect of these special characteristics is the implication regarding certain barriers to trade. In most countries, there exist different import regulations for native and modified starches. The latter being higher value added and subsequently higher taxes. Hence, a native cassava starch, embodying characteristics of a modified starch, will be taxed at the lower native starch, import tax rate. This translates into significant discounts for the food processing industry. Besides the economic impact of this, there are also additional environmental consequences, since native cassava starch will be a "natural product" which is more wholesome, contrary to modified starches. Two principal marketing strategies for cassava starch development to improve its EU market share are proposed. The implementation of these strategies, however will take considerable additional investments and very astute decision-making, organisation and management. The first requirement, that of a significant financial outlay, will come at a difficult moment, as current financial conditions in SE Asia have taken a major downward turn, reducing investors' confidence and the availability (and terms) for additional credit lines. Further integration through joint ventures with foreign (European or US) investors will be most essential. This may not only facilitate much needed capital, but will also significantly improve marketing capacity and product distribution networks, which are essential to successfully penetrate and capture EU existing and/or new product markets. Furthermore, are Asian cassava starch producers sufficiently ready and organized to face the corporate culture conditions facilitating price-fixing and the oligopolistic nature of the industry? This was the question posed by Sansavini and Verzoni (1998) while discussing the ADM price-fixing scandals in the lysine and citric acid industries. Increased joint ventures, both at the processing and marketing level, again, will be vital for survival. Government interventions: Both the US and the EU enjoy a variety of direct and indirect government subsidies, whereas SE-Asian producers and processors have little or no subsidies at all. As earlier mentioned, some 40% of total EU starch output benefits from production refunds. The EU farm and industry lobby is extremely strong, opposing any policy changes that will reduce profit margins. Reduced processing costs: While the number of Thai starch factories has decreased significantly, industry output continues to rise, further vertical integration and economies of scale (plant size) in processing are needed, as proven to be one of the keys to success in the US. Reduction of per unit cassava root costs: Cassava yields are still too low, the same as average cassava root starch levels. Furthermore, root availability throughout the year needs to be improved. Further integration of the industry may diminish cassava root price fluctuations. Low valued by-products of cassava starch manufacturing: Cassava (and potato) starch processing do not benefit from the generation of high-value by-products (as is the case for the grains). Hence, further R&D is needed for finding ways to add value to cassava by-products. This implies additional pressure on the reduction of production costs. Additional cassava product development research: Public and private starch product research investments for cassava are negligible compared to grain and potato based starch R&D. This offers an opportunity to further advance the potential that cassava starches have. Industry organisation: The starch industry organisation in SE Asia or Latin America is sub-optimal compared to the US and the EU. In Thailand five tapioca organisations exist, that could be collapsed into one. In China, there exist provincial starch associations, but these lack funds, structure and organisation. The Brazilian starch producers' organisation, (ABAM) exists, but lacks membershipU,U power and organisation. Industry and technology information is lacking. Vertical integration between farmers and processors is sub-optimal. Government policies: EU import tariffs and quotas have been seriously constraining cassava starch imports. Although expectations are that the next WTO trade round will further liberalise trade, the EU starch industry lobby is extremely strong (AAC, 1998). Market and marketing tools: While the Thai starch industry-marketing services seem to be quite efficient, this is not the case for other cassava starch producing countries. Especially, quality market information is lacking. Cassava publicity: There are still many misconceptions and absence of knowledge about cassava and its potential. This regards both the public and private sectors. Increased publicity, advertising the commercial applications of cassava starches (and other products) could boost interest, which could be translated into strengthened demand.